Some of South Park‘s best episodes and jokes come from Cartman’s anti-Semeticism and constant conflict with Kyle. A great example of this would be “The Passion of the Jew”, where after being inspired by the film The Passion of the Christ, Cartman tries to restart what Hitler did years ago, until the town meets Mel Gibson, who Matt Stone and Trey Parker parody as a sick, anti-Semmetic maniac. The episode was praised by critics and the Jewish community, who called it a great criticism of The Passion of the Chirst. “Jewpacabra” was an excellent episode of South Park, and easily the best of the season. In the episode, Cartman makes up a monster called a Jewpacabra, who he claims comes out every year on Passover. Since this year Passover is on the same week as Easter, Cartman says the Jewpacabra will attack attack the local Easter Egg hunt, held by Sooper Foods (providing you with both safety and fun!). 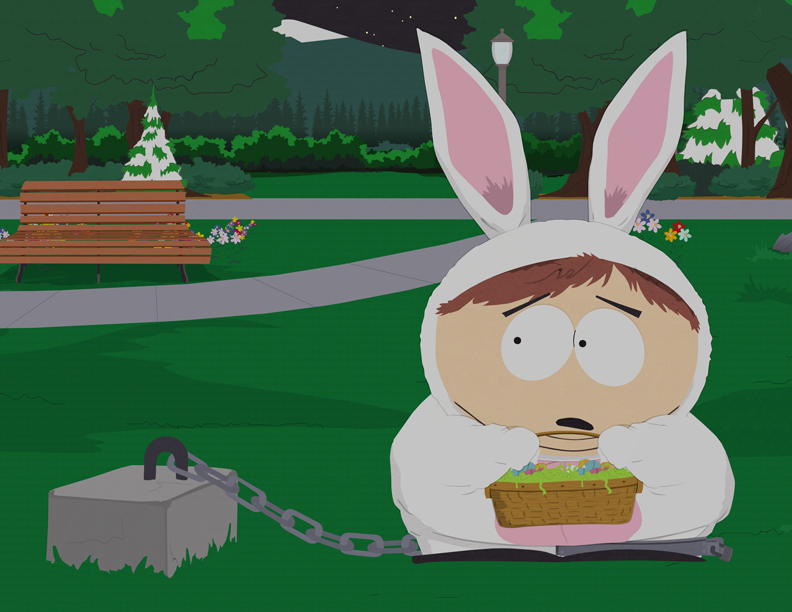 But of course, Cartman is just lying just to get all the Easter Eggs before the other kids. But Cartman then believes in his own creation (convinced by some Bigfoot hunters), and soon is terrified on his actions. The best part of the episodes came from this, to Cartman praying in the church (“Jesus loves me, this I know. For republicans tell me so”) to Sooper foods tying him up to a stake to sacrifice to the Jewpacabra. Plus, there was Cartman’s hilarious dream, which leaves him to believe that Judaism is the real religion because God will kill anyone who opposes it. Perhaps the most significant part of the episode is when Kyle frees Cartman from the stake. Though Kyle hates Cartman for his constant Jew-bashing and anti-Semeticism, he frees him from the stake, showing his true character. And though I wasn’t too sure if Kyle was skeptical or actually truly believed that Cartman did believe in Judaism, it was sure great too see. So to all my readers, happy Easter and Passover.